Heidi Li wrote the moral of the story this morning in Tragic but True: Neither Party Nominated a Candidate Worth Fighting to Elect. Heidi is just the latest bitter, paranoid holdout who is getting pressure from both sides to choose already. I find it curious that neither side seems willing to offer us anything in return. They just want us to make a damn decision. Anxiety. Hey, we didn’t start it and we’re no longer a part of it. We don’t have a dog in this race anymore. We tried to convince people that Hillary was the realest deal that we were likely to get but our voices were deemed to be insignificant until statistics proved them otherwise. Funny how a bunch of old, uneducated, working class sino-peruvian lesbians suddenly became a powerful voting bloc. Betcha the powers that be makes sure that never happens again. Yet, some supporters of either candidate are not happy with the state of affairs. People seem to think that whenever there are two options it MUST be the case that one is clearly preferable to the other. But do people really think that? Most mature people have had to deal with tragic choices, situations where no option is actually a good option. Students of literature know that this is the defining characteristic of tragic figures: they are tragic because neither altogether good nor altogether bad, and cannot be clearly lauded or despised – neither option really makes sense. This year each party produced a less than stellar presidential nominee – not that this has not happened in other years – but this year it is especially troubling because we do live in tumultuous times and it would be comforting if one could have any confidence that either of the Presidential contenders are up to the task of leading the country well at the present moment. But sometimes comfort is not available, not even when we really want it. And sometimes no good Presidential contender is running, not even when we really need one. Well, we bitter paranoid holdouts couldn’t get no satisfaction this year. We will never know whether we were right in our trust of Hillary Clinton. And now it looks like a whole bunch of other people are going to be sorely disappointed on election day. What can we say? You seemed so used to having your own way. Who are we to deny you anything? Unless we refuse to reward bad behavior. Hey, you can’t always get what you want. We’re not just a “shrieking band of paranoid holdouts,” or “50 people.” We’re 42% of Clinton voters. 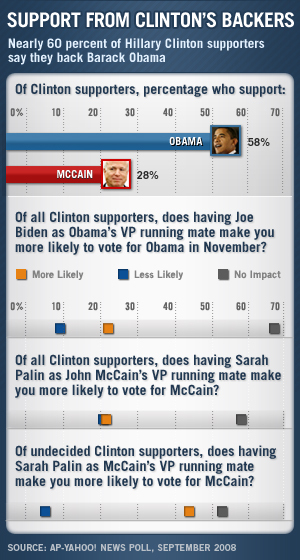 28% of us will vote McCain and the remainders like myself, won’t know until Election Day. Yet we are definite in our Nobama/PUMA stance and that’s what drives the MSM bezerk. This means a big difference especially in the big three swing states, Ohio, Pennsylvania and Florida. If you have 42% of Democrats not vote for the Democrat in those states, the other party wins. IT’S THE MAP, not the math. What’s even more startling to them is this: more than 1/2 of us felt zero impact regarding the VP choices on either side. Meh, Biden, Palin. Still doesn’t change the fact the DNC stole votes to push Obama across the Primary finish line. Who”l push him across the November 4th finish line? Not the Mountain states. WASHINGTON (AP) — Barack Obama’s support from backers of Hillary Rodham Clinton is stuck smack where it was in June, a poll showed Tuesday, a stunning lack of progress that is weakening him with members of the Democratic Party in the close presidential race. Clinton backers’ reluctance to support Obama helps explain why he is having a tougher time solidifying partisan supporters than McCain. Overall, 74 percent of Democrats say they will vote for Obama, compared to 87 percent of Republicans behind the Arizona senator. About nine in 10 Clinton supporters are Democrats. The problem that supporters of Clinton, the New York senator, have with Obama seems to flow from their measure of him as a candidate, not from issues. From establishing a timeline for a U.S. withdrawal from Iraq to abortion to canceling tax cuts on the rich, their views of the importance of issues are virtually identical to Democrats in general. Yet they find Obama less likable, honest, experienced and inspiring than Democrats overall do, and have a better view of McCain. And while majorities of Clinton supporters say Obama shares their values and understands ordinary Americans, they’re less likely to say so than Democrats overall. Wow – you mean we don’t like him because of his inexperience? And despite we share values, we still won’t vote for him? Maybe it had to do with all that election fraud stuff. And the article doesn’t call us bitter racists? Ya don’t say! Well my fellow PUMA/Clinton Democrats, here’s another reason why we’re willing to sit this election out. THIS is leadership in action, instead of hiding out somewhere in Tampa to study for a debate. Ya think Obama is in “Uh Uh” rehab? And on Morning Joe on MSNBC. Yes, Joe, we want Aretha too. H/T BostonBoomer for CNN clip, I can’t upload unless it’s Youtube, but here it is. Can we have Hillary back???? Was the debate schedule gamed for Obama too? We now know that the DNC did everything in their power to make sure Barack Obama would be the Democratic nominee for President. Never mind what the voters wanted, this is the year the DNC decided to nominate a black man. Anyone who thought Hillary Clinton was the better candidate was screamed at, called a racist, and told to either stand aside or get out of the Party. The DNC even scheduled their convention so the winner would accept the nomination on the anniversary of Martin Luther King’s “I have a dream” speech. Accident? I don’t think so. Hillary Clinton will appear on morning shows tomorrow, Tuesday, September 23 to discuss solutions to the economic crisis.